Now with new Ball Funnel for easy hookup! Free Shipping! Andersen continues to revolutionize the 5th wheel towing industry! Our popular Ultimate 5th Wheel Connection is now available in an aluminum version. 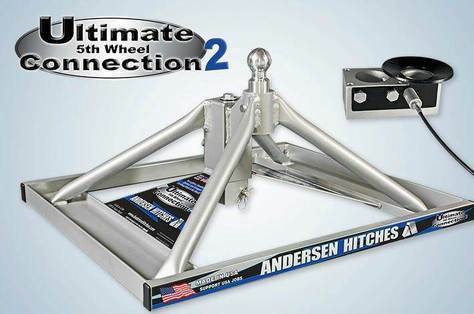 The Aluminum Ultimate 5th Wheel Connection is the lightest, strongest, most innovative 5th wheel hitch in the world. Weighing in at a mere 32 lbs, we have completely eliminated the common struggle of getting your 5th wheel hitch into the bed of your truck. The base of this unit can be completely installed in less than a minute. Andersen Hitches has truly found the solution to making life simple. We have created this hitch with our customers in mind. Our goal was to make not only the most innovative 5th wheel hitch in the market, but to do it at a price that won’t make you cringe. Base weighs only 32 lbs! Tonneau covers, step bars. Installation available.